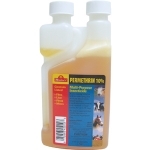 Kill and control fleas and ticks on dogs and in your carpets with ready to use permethrin water based product. 35 day residual gives longer control for fleas than most other formulas available. Can also be used on livestock. Not recommended for cats. For use on cattle, including lactating dairy cows, horses, swine, poultry, sheep and dogs. Controls flies, fleas, ticks, mosquitoes, lice, mites, cockroaches, spiders, keds and mange. Residual control for up to 28 days.